At Sunday Forever we’re all about Nice Things: beautiful kimonos worn while watching Real Housewives marathons on Bravo, sage to rid us of those unwanted bad vibes and lightly scented candles that make us feel like we’re luxuriating in a fancy hotel suite. Or, like we’re in our favorite yoga studio, Y7. But first, let’s take it back. Picture it. New York, 2016. Sunday Forever had just launched and Ashli Stockton (Sunday Forever’s Founder) was juggling 18-hour work days as a team of one; fulfilling and packing orders, updating the website, working with vendors - it was enough to drive a woman to...hip hop yoga. Y7 Studio was a new boutique fitness phenomenon and offered stressed out New Yorkers something completely unique - yoga with an edge. The flow goes down in a dark room (no mirrors) with pulsating rap and hip hop beats ushering participants through poses and stretches. Not only is it easy to forget about the world, it’s easy to forget you’re working out. But, the story doesn’t end there, no siree. One day, through their mutual friend Dria Murphy, founder of Alise Collective, Ashli met Sarah Larson Levey, the founder of Y7 Studio and - we won’t lie to you - there were sparks. They have a lot in common: both were born a world away from New York City, both worked in corporate roles before founding their lifestyle brands and both brands focus on fostering self-care and setting positive moods and mindsets. It was clear to both a collaboration was inevitable. And, just like that, the Sunday Forever x Y7 candle, Flow was created. 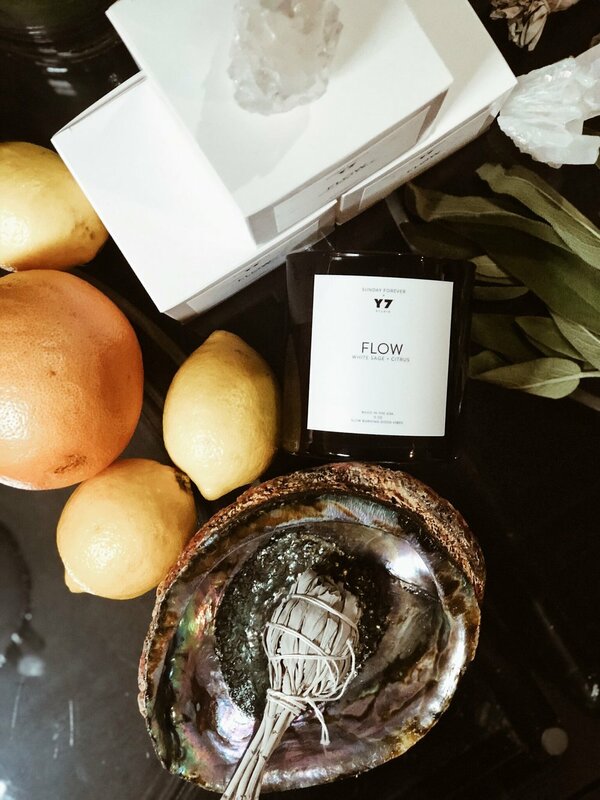 Inspired by the idea of community and spreading good vibes far and wide, Flow is a modern, crisp and pared-down scent featuring bright and calming notes of white sage and citrus. The candles are hand-poured in the USA and use Sunday Forever’s all-natural blend of coconut and soy wax. And, while we like to focus on inner beauty, we can’t help ourselves - this candle is G-O-R-G-E-O-U-S in its very own all black everything way. So, light it up, strike a pose and flow away. Catherine Spinley is a sometimes-writer and photographer based in New York. When not stalking other people’s dogs or yelling at people who refuse to walk up the left side of the escalator, she works in the beauty industry and practices yoga. You can read more from her at Worepaint.com.